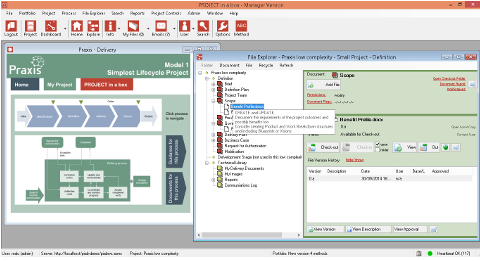 Praxis is a free framework for the management of projects, programmes and portfolios (3P). Where other project management standards choose to focus on one or two aspects of 3P expertise the Praxis Framework includes a body of knowledge, methodology, competency framework and capability maturity model. See the Video introduction to the Praxis Framework. This is all interlinked into one framework saving you lots of cross referencing work of trying to link the recognised standards yourself. Praxis is compatible with many other guides such as PRINCE2®, the APM Body of Knowledge and ISO21500. We have been looking for sometime to provide our users with a method aligned to the APM’s PMBoK. With the Praxis framework available that is now possible. So we can now support a whole new set of PM professionals with a method that will be familiar to them. Each of these starting point include guidance on how users might tailor the project once created to deal with more or less complex contexts. The team at Praxis were very helpful in supporting the method template development. They allowed us great access to the raw materials. You get the official diagrams and graphics. Also extensive links back from the method and templates to live guidance material on the praxis website. You get a full set of specially prepared templates. Your templates are all branded and containing the recommended headings for document sections and links to further guidance. If used in PIAB commercial products the template QA sections will also auto fill with key project properties. To see a video tour of the Praxis method in Community Edition just follow the link – here. You can also enjoy the video here on You Tube if you prefer. Although the framework is already polished and complete, there is still work going on to extend it into new areas. So we would advise you to keep coming back here or to the Praxis website for updates. 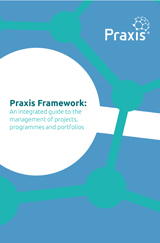 Praxis Framework is now also available as a book published by the APM – see more information on the APM website .